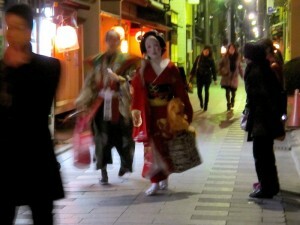 Followed geisha and maiko one evening February 2nd for Setsubun, the night of “obake” or ghosts, for the tradition of the antique New Year, costumed geisha and maiko, running from teahouse to “okiya” to entertain, and only I and another western man, very youngwere waiting in the doorways, and a beautiful Japanese couple in kimono, were patiently there too, but only I with camera it seemed. This entry was posted in Festivals by Micah. Bookmark the permalink.